Lok Sabha Elections 2019: Hitching a helicopter ride today to Wayanad, Kerala, Rahul Gandhi was greeted by his sister Priyanka Gandhi Vadra, along with loud cheers from a massive crowd of Congress workers waving party flags. 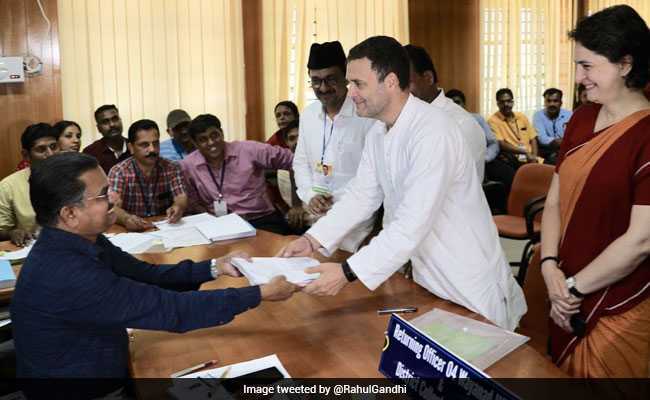 After filing his nomination from Kerala's Wayanad, Congress chief Rahul Gandhi today took to Twitter to say he was "overwhelmed by the love and affection of the people of Wayanad." Hitching a helicopter ride today to Wayanad, Mr Gandhi was greeted by his sister Priyanka Gandhi Vadra, along with loud cheers from a massive crowd of Congress workers waving party flags. A marching band accompanied Mr Gandhi to the government office in Kalpetta, where he filed his nomination. The roadshow marked the start of Mr Gandhi's Wayanad campaign. Mr Gandhi in his Twitter post also shared photos of the entire event. In one of the photos, a smiling Mr Gandhi, along with his sister, grinning from ear-to-ear, handed over his nomination papers to the returning officer. Two other photos showed glimpses of the massive roadshow. Mr Gandhi also shared a photo of himself, reaching out to help a few journalists, who were injured while covering the rally. Three journalists had suffered minor injuries after a portion of a media vehicle broke off at the rally. Sharing concern over their well-being, the Congress chief in his tweet, also said he wished the journalists "a speedy recovery." The tweet by Rahul Gandhi, has racked up over 13,000 likes and more than 3,000 retweets till now. Earlier during the day, Priyanka Gandhi Vadra, who is the Congress's East Uttar Pradesh-in-charge, also tweeted her wishes to her brother, calling him "the most courageous man I know." "Take care of him Wayanad, he won't let you down," tweeted Ms Gandhi Vadra. Her tweet has until now collected 8,000 retweets and more than 32,000 likes. However, not everyone is pleased with Rahul Gandhi's decision. The Left Front, which has been unrelenting in its opposition against Mr Gandhi contesting from the coffee-growing district, said in a tweet, that Mr Gandhi "could not create a wave in his own home town. What wave is he going to create in South India?" The left's reply comes after Mr Gandhi said he would "not say a word against" them. "I will not be making a single attack on the CPM. You will not hear a word against the CPM from me," said Mr Gandhi. The BJP pulled no stops as well. Union minister Smriti Irani left for the Gandhi bastion Amethi today to give a warning. The Congress president had "insulted" Amethi by filing his nomination from a second constituency, said Ms Irani. "This is a big sign that a person who has enjoyed power piggybacking on Amethi for 15 years has left Amethi and is filing his nomination today from some other place. Amethi will never forget the insult and betrayal," she said.